Want to make some hummus but out of chickpeas? 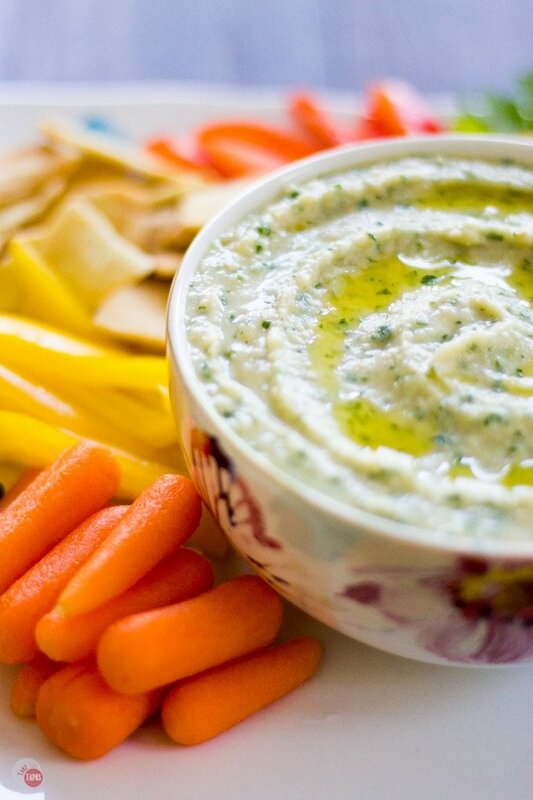 Check out this recipe for White Bean Parsley Hummus. No need for Tahini, just 5 minutes and a few ingredients will have you snacking like a pro but with a twist! I’m sure you know by now that I love hummus, but have you ever found yourself wanting to make some and not having all the ingredients? Traditional hummus is made with chickpeas, tahini, olive oil, garlic, salt, and pepper. But what if you don’t have chickpeas? Have you ever tried using a white bean, or cannellini bean instead? Well, fear not, because it works! Read on to hear more! My favorite bean, hands down, is the dark red kidney bean. Don’t ask why because I don’t really have a good answer. Maybe it’s because my parents used them so much in cooking. If you use your Google machine it will give you a ton of forums where people discuss this topic at length with no real answer other than the dark one is “meatier” but who really has time for that? I just stick with the dark red ones and go on about my business. I will say that I do get a little peeved when the husband brings back light red ones from the store. So to make my point, I just use them with a scowl on my face and remind myself to not let him shop for me again until he can prove himself trustworthy. I have never let him forget the 10 pounds of white sugar he brought back when I asked for 10X powdered sugar… Because why would I? The cannellini bean, or “white Italian kidney bean,” is in a tie for second with the black bean on my list of favorite beans. Yes, I have a favorite bean list. I love to use the cannellini beans in soups because their skins tend to separate from the bean itself during a long cook time and it adds so much texture to the dish. If they are so great in soups, why not hummus? While my friend Michelle from A Dish of Daily Life is still recuperating from last month’s surgery, a group of us are trying out her recipes. Being that it is Game Day season, I’m opting for a dip of hers. Low and behold a hummus recipe! Flipping through her hummus collection, she really likes hummus too, I decided on a white bean and mint hummus. 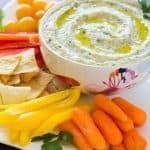 It sounded delicious, I was in the mood for hummus, and mint is a great addition to the mix. I grabbed my purse and headed for the store to grab some mint. Already having everything else on hand, because I always have some beans in the pantry, all I needed was some more garlic and some fresh mint. I can’t grow fresh herbs at my house no matter how hard I try. Black thumb and all, I am surprised my kids are still alive at this point. Get to the store, navigate around all the slow people and those standing in the middle of the aisle yacking with someone like they are the only two people on the planet, and make it to the produce department. Sometimes I hate living in a small town and at other times it’s great. Looking for “fancy” ingredients is not a good time to live in a small, southern town that loves their cracker topped casseroles. There sure was a lot of parsley there, though. And cilantro because we do love our Mexican food. Remembering that I saw a recipe for White Bean Parsley Hummus on Michelle’s site I opted for that one. Or I could just lie down on the floor and cry out “When will there be mint?!?! ?” Making white bean hummus with parsley seemed the more adult thing to do. Plus I was hungry so tantrums have to wait until after my “Hangry” stage has passed. I grabbed my tea on the way out the door, dashing around the other stationary shoppers, and headed home. Within 5 minutes I was eating my white bean parsley hummus. Happily dipping my bell pepper sticks, and watching my housewives of whatever city. The moral of this story is that you can make something great, even without fancy ingredients because you are stuck in “no man’s” land, and manage not to run down pedestrians in the store in the meantime. I must not have been that “Hangry” because I didn’t yell at anyone. I’m known to do that. Or just stand there and sigh really loudly while tapping my shoe. Real mature right? I don’t care because grocery shopping is my Olympic sport and I don’t have time for amateurs when I am clearly starving to death. Do you need an easy, 5-minute snack that you can whip up after a jaunt to the store? 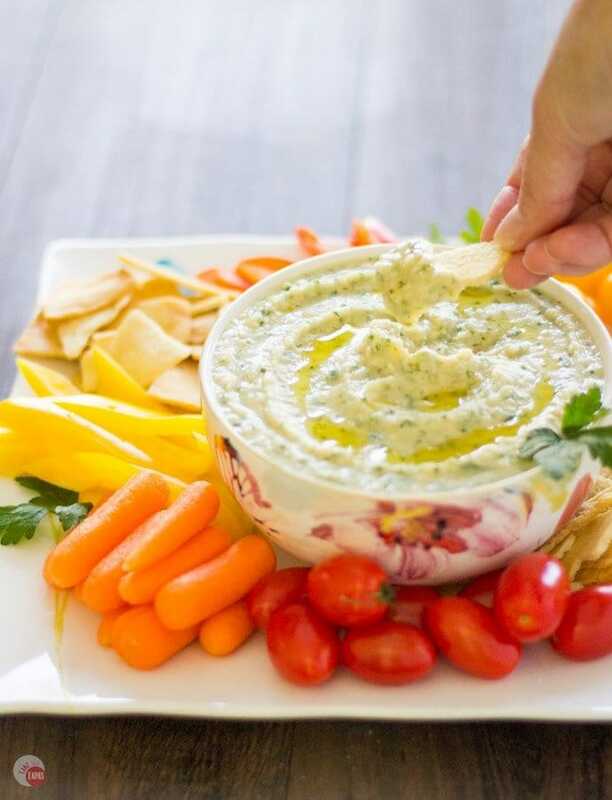 Then definitely make this creamy, delicious white bean parsley hummus, forgetting all the “fancy” tahini and such, and stream a few more episodes of that series! Want to make some hummus but out of chickpeas? 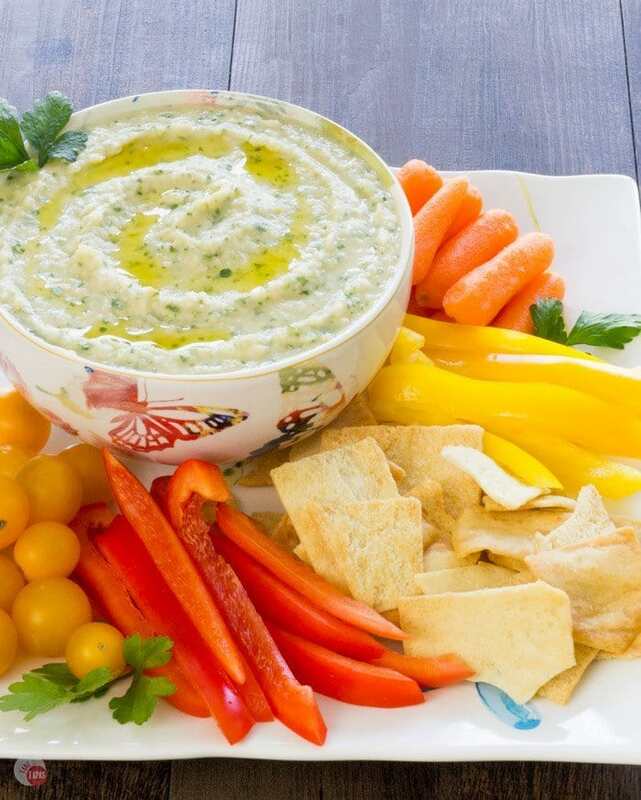 Check out this recipe for White Bean Parsley Hummus. Five minutes and few ingredients is all you need! Add all the ingredients to the bowl of a food processor. Pulse a few times to get things mixing. Turn on for a minute or so, watching until all the ingredients are blended to your liking. If it seems thicker than you like, add some water a tablespoon at a time. I added the above amounts of salt and pepper but feel free to season to your liking. 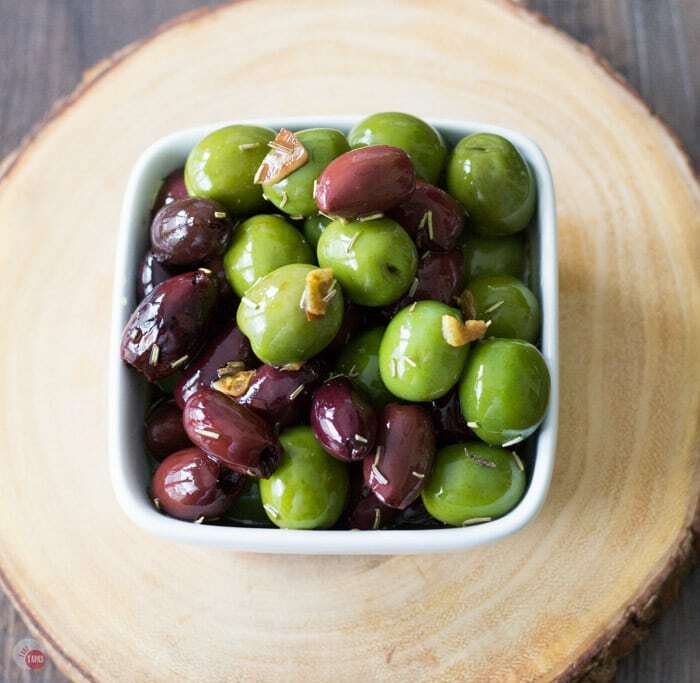 Last month I made some Marinated Olives from Michelle’s site. That was a good choice for me. 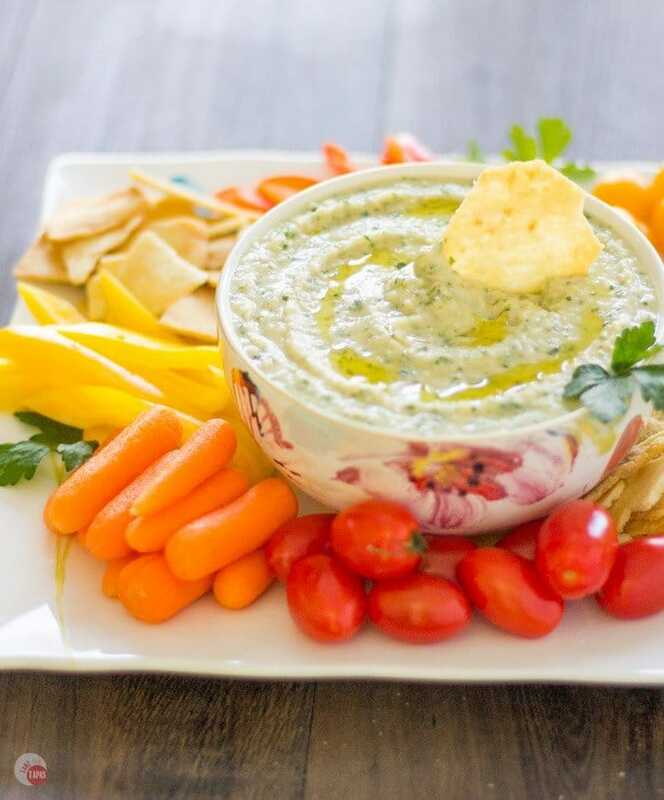 Hop on over there and find your new favorite too once you make this white bean parsley hummus. 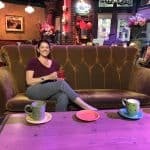 Here is what some of my friends are making from her site this month! This recipe first appeared on A Dish of Daily Life. Wow, this sounds really good. Never thought to use white beans instead of Garbanzo. I love that you have a favorite bean list! I mean, who doesn’t, really? (Shout out to my #1, black beans!) The hummus looks perfect for a slightly-healthier-than-I-usually-make snack. I need some of those in my life.